A computerized debit system is in place in all schools. Every student has been assigned a PIN, which is their student ID number. Students must enter their PIN regardless if they have cash or are using money on account. Any amount of money may be sent in for your child's cafeteria account. Please return a form (mailed home a few weeks prior to the start of school) if you wish to restrict your child's access to ala carte items, breakfast and additional purchases. A notation will be placed on your child's account if you return the form. Students will be allowed to purchase extras unless we receive a note from the parent indicating otherwise. Students may pay cash each day for purchases. Maintaining a balance is encouraged, but not required. Students are expected to have money in their account in anticipation of purchases, unless they are paying with cash. A maximum amount of three meal charges in which the student does not have cash or money on account will be permitted before an alternate meal of peanut butter and jelly will be provided in grades 3-12. Substitutions will be provided for students with special dietary needs. Balances from the previous school year will be available for use on the first day of school. Please remember that any money remaining at the end of the current school year will be forwarded to the following school year; refunds will not be issued unless a student is withdrawing from the district or is graduating. 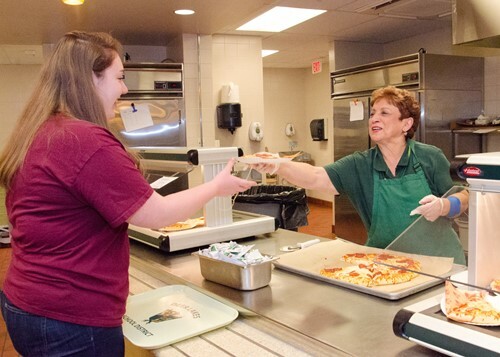 Students eligible for free meals do not need to make deposits. However, they are welcome to deposit money for extras. The system is coded to recognize that your child is free or reduced when they enter their PIN. Therefore, a child's status remains completely confidential. Please make all checks payable to Deer Lakes Cafeteria Fund. Checks returned from the bank are subject to a $25 service fee. On 2-hour delay days, breakfast will be served. Cold Breakfast only will be available at the MS/HS from 9:30-9:45. Delayed breakfast time at CV/EU are 10:45-11am. The cafeterias will mostly follow the regularly scheduled lunch menu.